Woody Allen’s latest annual output is one of his more obvious vacation movies. Meaning: it’s clearly one of those films where Allen thought about where he’d like to vacation with his family first and a locations for another film second. 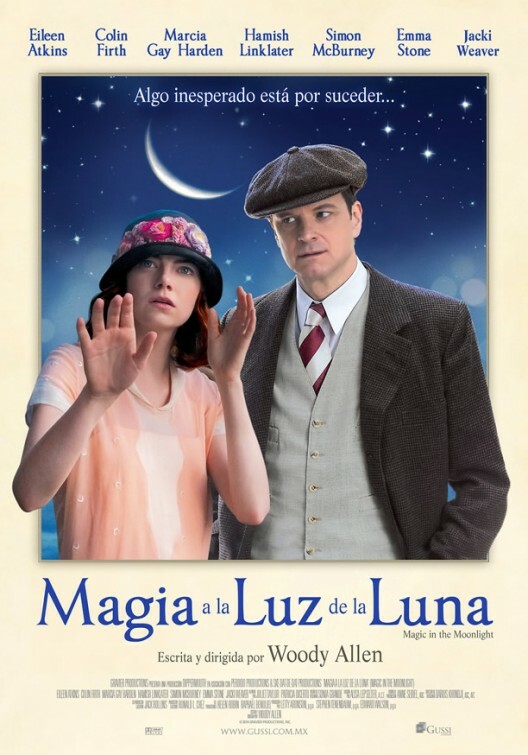 “Magic in the Moonlight”, which he wrote and directed, is a romantic comedy that takes place predominately in the French Riviera, surroundings that are accentuated in this easy-going tour along curvy roads nestled in beautiful mountainsides. Allen must have been too relaxed though when he came up with this dreadfully uninteresting screenplay. His two leads are generally likable in everything they do, yet wind up flailing in Allen’s vacation mode, making this film another flat entry in his canon. In the late 1920s, we meet cantankerous magician Stanley Crawford (Colin Firth) performing as Chinese conjuror Wei Ling Soo before an enraptured audience in a Berlin theater. Backstage, the arrogant performer is greeted by his good friend and fellow magician (though not as celebrated), Howard Burkan (Simon Burney, “Harry Potter and the Deathly Hallows”), who informs Stanley of a young American mentalist who causing quite a buzz for herself in the South of France. 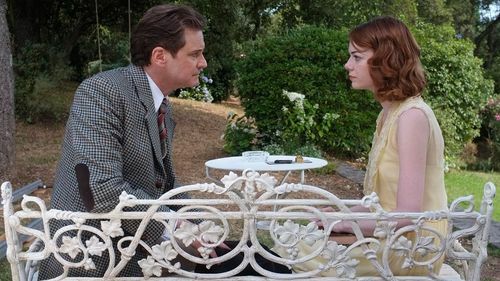 Knowing how the work of phony spiritualists boil Stanley’s blood and how much the cynical Englishman jumps at the opportunity to debunk them, Howard persuades his friend to travel with him to Côte d’Azur mansion, where the wealthy Catledge family is hosting the clairvoyant Sophie Baker (Emma Stone) and her mother (Marcia Gay Harden). They hope to communicating with the late husband of Grace Catledge (Jacki Weaver) the family matriarch by staging a séance. Upon arrival, Stanley introduces himself as Stanley Taplinger, a guest of Howard’s and someone who is interested in seeing first-hand Sophie’s wondrous talents. As much as he tries to brush her work off as another charlatan, Stanley comes to see just how absorbing this wide-eyed beauty is, especially with Grace’s son, Brice (Hamish Linklater), serenading her with a ukulele at every turn. Determined to prove Sophie a fraud, Stanley maneuvers around the Catledge family’s gullibility and, much to his surprise, starts to entertain the notion that there may be magic in the world. He becomes astonished with Sophie’s detailed mind-reading and her supernatural feats and even finds himself entertaining romantic thoughts, which he confesses to his dear Aunt Vanessa (Eileen Atkins, “Robin Hood”), who lives nearby. Between his newfound belief in Sophie’s abilities and his awareness of amorous feelings, Stanley must determine what to do with his new perspective in his head and be honest, for once, with what is happening in his heart. For his 44th film, Allen returns to his own fascination with magic, last seen in his 2006 mystery/comedy “Scoop”, starring his recent siren, Scarlet Johannson. 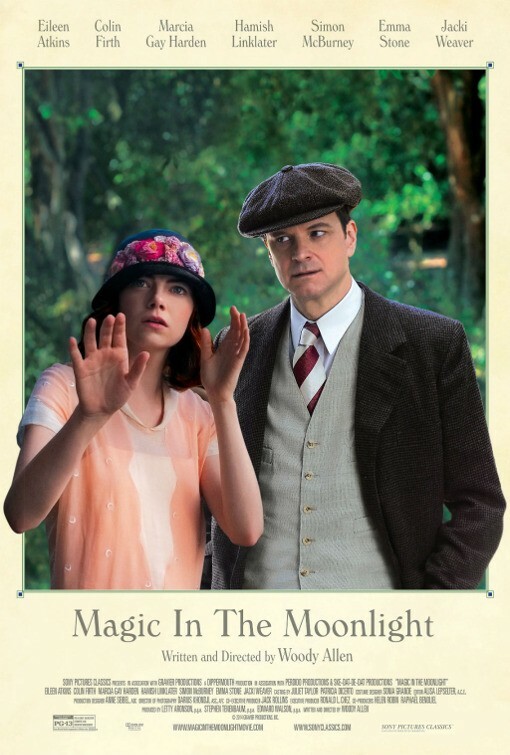 With “Magic in the Moonlight” the focus on magic is slighter, leaning more on the supernatural, and his new siren is now Stone (who is currently filming Allen’s next film as well). The hocus pocus element isn’t the only thing familiar here though. Actually, if you’ve seen a handful of Allen films, everything feels familiar here, from the Cole Porter music (and the yawn-inducing use of “Bolero”) to a protagonist who is either a neurotic or an unlikable pessimist (Firth becomes a mix of both). So, while die-hard Allen fans may just lean back and accept a by-the-numbers entry from their favorite director, “Moonlight” does no favors for viewers like me, who are hit or miss with the legend. The film’s strength are few, but they chiefly lie in the performances of Firth and Stone. Firth is great at being an acidic skeptic and Stone easily conveys a beguiling sweetness and naiveté that is convincing and amusing to watch. However, when Allen lazily attempts a May-December romance between the two (who come across as father and daughter), the real-life 28 year difference between the two actors is awkward and distracting. Not to mention it’s hard not to think of Allen’s own romantic life that has been covered in the media on and off for decades. Ultimately, the Stanley/Sophie match-up feels forced and lacks a sense of chemistry. It’s too bad Allen felt the need to lead these two characters down an unwanted path that dead ends. Allen does try to zing us with a screenplay twist that anyone still awake could’ve caught, but it’s in the very ending where he really exasperated me. Let’s just say there’s a better ending on-screen here, but Allen just doesn’t trust it and instead goes for predictable sap. Despite the film’s shortcomings, it’s worth noting that it looks absolutely fantastic. That’s due to Iranian-French cinematographer, Darius Khondji (who previously vacationed with Allen on the films “Midnight in Paris” and “When in Rome”) and uses just the right amount of color and light to accent the era. He creates an idyllic surrounding for these characters to inhabit, almost as if walking us throw a time machine and stepping into the glow of the 20s. Watching this film reminded me how Allen’s continuous output is similar to Bob Dylan’s “Never-Ending Tour” (which has been called that since the late 80s), in that both iconic artists have careers that show no sign of calling it quits and both have also had their share of hits and misses in their later years. For every critically praised film of Allen’s, you can find ho-hum films that come before and after it. Like Dylan, it seems like all that matters to the auteur is consistently delivering a well-produced, albeit familiar, product.